But most people do carry phones with cameras. So this morning I looked out my window, snapped a photo on my iPhone, shared it on Twitter, and created the hash tag #ViewFromMyWindow. Then I asked people to do the same, using the hash tag. Dead simple. Just point, shoot, tweet. Early on, I retweeted anyone who participated to create a sense of momentum. It exploded. 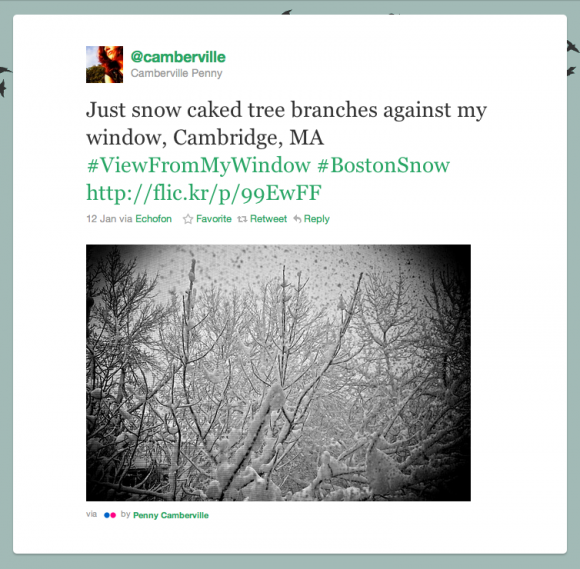 By noon, #ViewFromMyWindow had become a trending topic (in Boston), and it was Twitter’s top trending topic for photo tweets (worldwide). I used CoverItLive to create a live stream (actually, a “ticker”) that automatically pulled in all these tweets and photos. The software automatically converts ugly image URLs (http://twitpic.com/BlahBlah) into photos. This created a sense of immediacy and scale, a fun and easy way to get a look at backyards across the state. So we finally figured out how to engage people in a snowstorm. It’s all about mobile. It seems like Flickr has catered more to the high-quality work of DSLR photographers and ignored the mobile space. It’s always had an API available for third-party Twitter app developers, and I never understood why so few adopted it. I don’t think Flickr is going anywhere anytime soon, but it is interesting to see it positioned as a destination site for photography in contrast to new mobile photo services which are a function of people’s lives and experiences.